The Royal Canadian Mint announced this week the creation of 1,500 gold coins to commemorate the canonization of Pope John Paul II. 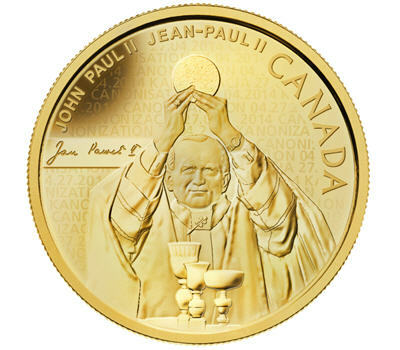 "These coins honour the extraordinary life and legacy of Pope John Paul II, and his accomplishments of universal significance: his message of courage, his defence of freedom and the profound statements of hope he expressed to the world," Wladyslaw Lizon, Member of Parliament for Mississauga East-Cooksville, said in a statement. The mint's CEO Ian E. Bennett explained that Pope John Paul II was the first pope in history to visit Canada. "These gold and silver coins are beautiful additions for any collector or stunning gifts for history buffs, followers of Pope John Paul II and Canadian history enthusiasts," Bennett said. The mint has also created 8,500 silver coins with the pope's image. The gold coins will sell for $649.95 and silver for $69.95. The reverse image on both coins shows Pope John Paul II offering Mass during his first visit to Canada in 1984.